The proportion of the population reporting a health problem is highest in Spelthorne (14.9%), Tandridge (14.8%) and Mole Valley (14.7%) and lowest in Elmbridge (12.1%). Fewer Surrey residents reported a health problem than the national average. In England as a whole 17.6% reported a health problem with 9.3% limited a little and 8.3% limited a lot. general health over the last year, choosing from Good, Fairly Good or Not Good. The question and options changed in the 2011 Census to “How is your health in general”, with 5 options – Very Good, Good, Fair, Bad and Very Bad. It is therefore difficult to compare the data with 2001. 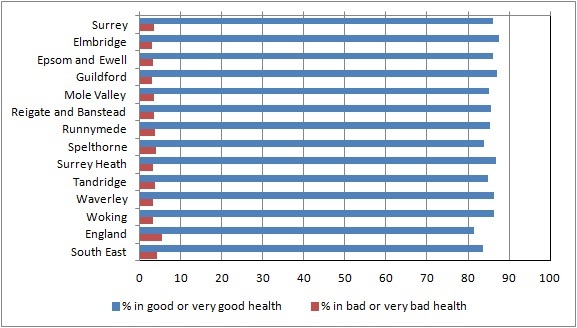 86% of Surrey residents reported good or very good health with 3.5% reporting bad or very bad health. The healthiest borough is Elmbridge where 87.4% are in good or very good health and the least healthy is Spelthorne where 4.1% are in bad or very bad health. 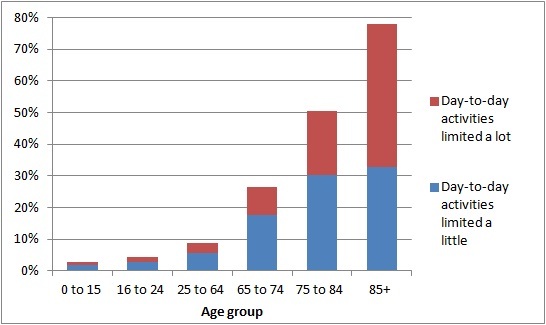 The proportion of the population reporting bad or very bad health increased with age. 18.3% of people over 85 were in poor health compared with just 0.4% of children under 16. The Census asks people whether they give any help or support to family members, friends, neighbours or others because of long-term physical or mental ill-health or disability, or problems related to old age. The question was unchanged from 2001. 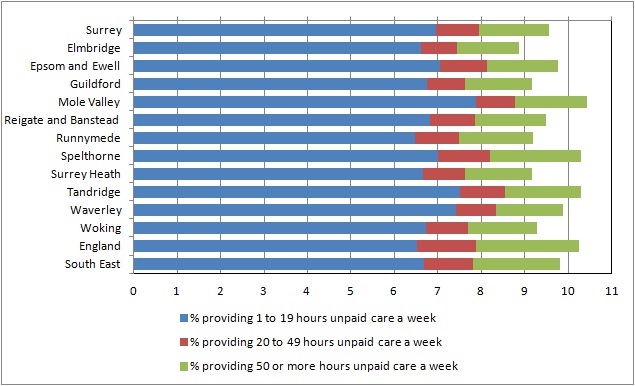 108,400 (9.6%) Surrey residents reported that they provide unpaid care. The proportion has changed little since 2001 when 9.4% were providing care. Most carers are providing less than 20 hours per week, but 11,000 are providing 20 to 49 hours per week and 18,500 are providing more than 50 hours per week. Reflecting the population with long-term illness or disability, Mole Valley (10.4%), Spelthorne (10.3%) and Tandridge (10.3%) have the highest proportion of carers and Elmbridge (8.9%) the lowest. Surrey has fewer carers than national average. In England as a whole, 10.2% of the population are providing care, with 2.4% providing more than 50 hours per week. 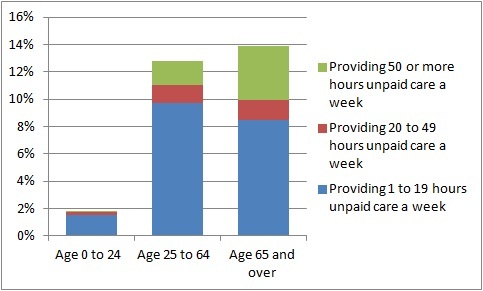 Older people are more likely to be providing unpaid care than younger people, and providing more hours of care. Nearly 14% of people aged 65 or over provide care with more than quarter of these providing 50 hours or more. 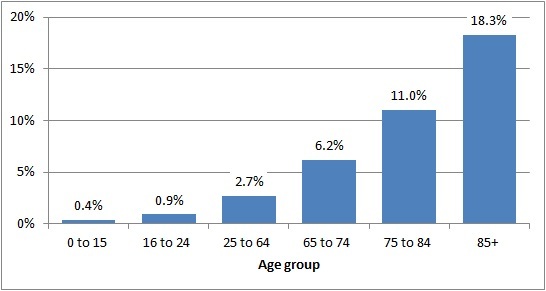 Among young people under 25, less than 2% provide care, around one in 13 of these providing 50 hours or more.